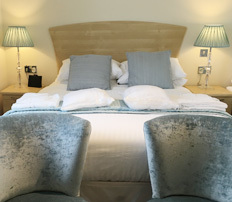 The Old Quay House Hayle makes the perfect base for your stay in Cornwall, with its fabulous bed and breakfast accommodation. Our beautiful garden lodges are close to the A30 and resorts such as St Ives and Carbis Bay, yet a world apart from the hustle and bustle, with a peaceful setting at the water’s edge of the Hayle tidal Estuary. 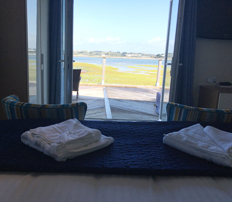 Our nine elegantly furnished en-suite garden lodges offer a relaxed atmosphere, with several offering beautiful views of the tidal estuary. 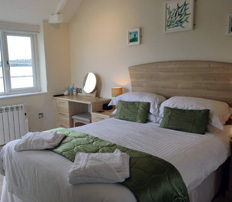 Many of the lodges are located right on the estuary edge, offering a breath-taking panoramic view to wake up to, and although you have the privacy of your own garden lodge, you are also only yards away from the inn, where you can enjoy a choice of home-made meals. 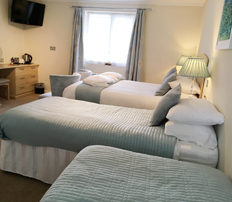 You can also take advantage of our free on-site parking, a real bonus for those wishing to explore St Ives and the surrounding area, without the hassle of trying to find parking. Simply hop on the nearby branch line train and discover the delights that West Cornwall has to offer.